I'm not sure how you arrived at this page, so let me start by introducing myself. My name is James Hannon, and I am a Bronx native (East 196th Street and Briggs Ave) now living and working in Jersey. 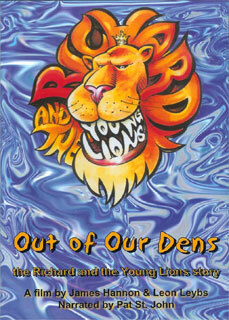 I am a documentary filmmaker who has released Out of Our Dens - The Richard & the Young Lions Story. You can find everything you want to know about me and my other projects on the other pages of this website. Recently, I became interested in doing a documentary on the Bronx gangs of the 1950's and 1960's - specifically the Ducky Boys and the Fordham Baldies. How and why did I get interested? Well, you can read all about how this inspiration came about at my Tribute to the Wanderers Movie that was recently published in the Winter 2006 issue of Back in the Bronx magazine. Glad you asked. As you can imagine, ex-gangmembers aren't the most willing to give up their stories. The obvious reason why is that they don't want to get in trouble - and I'm not really talking about criminal trouble since chances are they've either served their time or the statute of limitations have long expired. What I am finding as a big obstacle is that these ex-gangmembers don't want their family and friends to know what they did when they were young and careless. My solution is that they can be anonymous. I am not looking to get *anyone* in trouble - All I want to do is to tell as true a story as I can of these two gangs. I've already got a few connections who are absolutely great, but I really need to get quite a few more to fill in some of the missing pieces. Remember it's been 40 years since these gangs roamed the Bronx, so naturally there's some forgotten memories that need just a small push to be remembered. So, if you know anything about the Ducky Boys or the Fordham Baldies, please email me and tell me. People who have encountered either of these gangs either as friends. other gangs, the police department, etc. Or even if you just saw them around the neighborhood, or heard a rumour about them. If I haven't mentioned it here, and you think it could be useful to me, please send it over - I may not use everything, but you'll have my heartfelt appreciation! My e-mail address is jameshannon@lantern-media.com - this is probably the best way to reach me. You can also reach me at the phone number at the bottom of this page. Like I said up top, this will be a changing document, so please keep checking back as I add more stuff.